The circus becomes both a refuge for Depression-era misfits and a site for additional cruelty. Ellen Marie Wiseman gathers potent Gothic elements in The Life She was Given to examine the impact of child abuse across generations. A sumptuous plot balances horror and tenderness to reveal lesser-known facets of history. 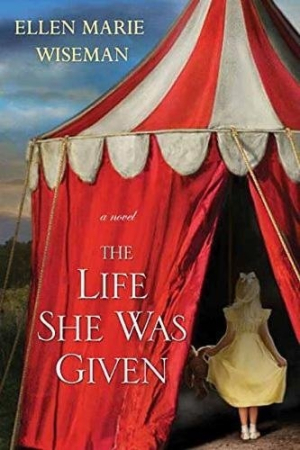 In the 1930s, Lilly, a daughter held captive in Blackwood Manor’s attic, is sold to the circus. In the 1950s, Julia, a runaway teen, inherits the family manor and horse farm, where she uncovers lies about her past. Coralline Blackwood is an exacting matriarch who wields the Bible as a weapon. When she decides to get rid of Lilly, whose albinism she calls an abomination, the effect of her fury is manifest in characters who must learn to forget her influence. Vibrant chapters alternate between Lilly’s struggle to adapt to her new role in the circus and Julia’s efforts to manage the manor after Coralline and her husband’s death. The parallels between the young women are drawn with ease, allowing the narrative to seamlessly dart between decades. Sections that detail Lilly’s transformation from sideshow freak to fraudulent medium to star performer reveal the lurid side of life on the midway as well as her own changing view of herself. Julia’s initial unease at being tasked with taking over her family’s horse business awakens a passion for animals. As each character grows, their histories overlap; the secret that binds them lies at the heart of the book’s tragedy. Shocking as Coralline’s acts are, Lilly’s story is never entirely bleak. The novel deftly weaves in moments of reprieve. The circus becomes both a refuge for Depression-era misfits and a site for additional cruelty. Strong characters, such as Glory, a tattooed lady, and Cole, one of the elephant trainers, highlight the human side of a business built on illusions. Their friendship with Lilly creates some of the book’s more memorable scenes. That Lilly’s albinism is considered beautiful, exotic, or a monstrosity—depending on whose perspective is taken—also adds a fascinating dimension to a story precipitated by Coralline’s own vanity. The Life She was Given is a vibrant maze of desires. The sharp divide between expectations and painful truths, mothers and daughters, past and present, culminate in a sensational finale.